Research performed during and after the outreach showed that this series was an unprecedented success. Superbook, also known as Animated Parent and Child Theater, is an anime television series produced by Tatsunoko Productions in Japan in conjunction with The Christian Broadcasting Network in the United States. During its launch in Japan, it is estimated that over four million people watched each weekly episode of Superbook on television, resulting in the Bible becoming the best-selling book in that country. From Japan, the Superbook series went on to air throughout the world from Asia to North America. By 1989, in the midst of economic and political turmoil, Superbook began broadcasting in the Soviet Union to astounding results. Superbook aired during prime time on the Soviet National Channel. CBN received over six million letters from children, introducing a whole new generation to the Bible. Even today, the Superbook Kids Club is one of the highest rated live-action children's programs in Ukraine. Because of today's new storytelling technology, the original series is losing appeal with this media-savvy generation. To solve this problem, CBN is producing a re-imagined, computer generated, animated version of Superbook. Our goal is to produce a new series that will honor the life-changing legacy of the original series and re-introduce it to a new generation. By joining The Superbook DVD Club. When you join The Superbook DVD Club, you will automatically receive each new episode of Superbook. In addition, we will send you two free copies of each new episode in attractive packaging that you can give as gifts to others. Your tax deductible gift will also help produce future Superbook episodes and bring the Word of God to children around the world. Call 1-866-226-0012 or you can learn more about The Superbook DVD Club here. If you forgot your password, click on the “Sign In” link at the top of the page. In the box that opens, click on “I forgot my password” below the “Password” field of the form. To change your password or personal information you will first need to sign your account. Then click on your profile name at the top of the page. Once you land on your profile page, click on "Edit Profile" to the right of your character profile. You will then be able to change your password and any other personal information. Baal was a false god worshipped by the Canaanite people in the time of ancient Israel. As seen in “Elijah and the Prophets of Baal,” the people made idols that they would pray to, sacrifice to, and worship. After Elijah declared that it would stop raining, God withheld rain from the area, and it did not rain for three and a half years! The Bible tells us, “Elijah was as human as we are, and yet when he prayed earnestly that no rain would fall, none fell for three and a half years!” (James 5:17 NLT). Sacrificing animals was part of ancient religions, and even the Law that God gave the nation of Israel included animal sacrifices. The Bible explains, “In fact, according to the law of Moses, nearly everything was purified with blood. For without the shedding of blood, there is no forgiveness” (Hebrews 9:22 NLT). It is important to know that the sacrifices called for by the Law of Moses pointed forward to Jesus, because Jesus shed His blood on the cross for our sins. Jesus was the ultimate sacrifice for our sins, so there is no need for sacrifices anymore. Why didn’t you show the deaths of the prophets of Baal? Since the people were worshiping the false god called Baal, why didn’t you refer to the true God of Israel by His Hebrew name, Yahweh? Whenever biblical persons in the Superbook episodes say something that is recorded in Scripture, their words are taken directly from the New Living Translation, Contemporary English Version, or New King James Version. These versions of the Bible use the word LORD to refer to the God of Israel, indicating His covenant name, Yahweh. As an example, the New Living Translation says, “Then Elijah stood in front of them and said, ‘How much longer will you waver, hobbling between two opinions? If the LORD is God, follow him! But if Baal is God, then follow him!’” (1 Kings 18:21). What is an incense offering? An incense offering was the burning of holy incense in the Temple, and was commanded by God. When the incense was poured on the hot coals, it released a sweet aroma that rose up. The incense offering was a symbol of the people’s prayers to God. Like the incense rising in the Temple, the Israelite’s prayers would rise to the throne of God. A psalm of David associates his prayer with the offering of incense in the Temple: “Accept my prayer as incense offered to you, and my upraised hands as an evening offering” (Psalm 141:2 NLT). The book of Revelation also associates the holy incense with the prayers of God’s people: “Then another angel with a gold incense burner came and stood at the altar. And a great amount of incense was given to him to mix with the prayers of God’s people as an offering on the gold altar before the throne. The smoke of the incense, mixed with the prayers of God’s holy people, ascended up to God from the altar where the angel had poured them out” (Revelation 8:3-4 NLT). We used creative license in depicting Gabriel’s entrance to make it both dramatic and powerful and to cause Ezekiel to have a sense of wonderment. There are a number of Bible verses that describe heavenly beings with wings. For example, the book of Revelation talks about the four living beings around the throne of God: “In front of the throne was a shiny sea of glass, sparkling like crystal. In the center and around the throne were four living beings, each covered with eyes, front and back” (Revelation 4:6 NLT). They were the ones singing “Holy, holy, holy…” The Bible says about these beings, “Each of these living beings had six wings, and their wings were covered all over with eyes, inside and out. Day after day and night after night they keep on saying, ‘Holy, holy, holy is the Lord God, the Almighty—the one who always was, who is, and who is still to come’” (Revelation 4:8 NLT). In addition, when God gave Moses instructions for the Ark of the Covenant, He said that it should have cherubim with wings on the lid: “The cherubim will face each other and look down on the atonement cover. With their wings spread above it, they will protect it” (Exodus 25:20 NLT). The name John means “God is a gracious giver.” This could be a reference to the miraculous work of God in graciously giving Zechariah and Elizabeth a child even though they were very old and Elizabeth was not able to conceive. What were the white streams of light coming out of the Temple and flowing through the priests’ hands? We used creative license to show the manifest presence of the Holy Spirit flowing from the Temple. The Spirit of God brought the favor and blessings of the Lord to the people. God had commanded that the priests bless the people of Israel with these words: “The LORD bless you and keep you; the LORD make His face shine upon you, and be gracious to you; the LORD lift up His countenance upon you, and give you peace” (Numbers 6:22–27 NKJV). This is called the priestly blessing. The priests were making a hand symbol according to an original Jewish tradition. The hand symbol represented the Hebrew letter “Shin,” which looks similar to an English W and has a “sh” sound. The hand symbol, then, refers to the Hebrew word “Shaddai.” “El Shaddai” is one of the Hebrew names for God, and means “the Almighty.” It has been interpreted as “the All-Sufficient,” and refers to God’s power and ability to bestow blessings upon His people. What kind of writing tablet did Zechariah use when he couldn’t speak? How was Mary’s question to the angel Gabriel different from Zechariah’s? It seems that Zechariah doubted the angel’s declaration, which was a message from God. On the other hand, Mary did not doubt the prophecy—she only wondered how it would come to pass. We used creative license to show Elizabeth being filled with the Holy Spirit. The Bible tells us what happened when Mary greeted Elizabeth: “At the sound of Mary’s greeting, Elizabeth’s child leaped within her, and Elizabeth was filled with the Holy Spirit” (Luke 1:41 NLT). Why was the girl made a servant? Naaman’s forces had invaded Israel and fought battles with the Israelites. During one of the battles, some of the Israelites were captured, and as was often done in that period, they were made to be servants in a foreign land. The young girl was taken to be the maid of Naaman’s wife. The Bible tells us, “At this time Aramean raiders had invaded the land of Israel, and among their captives was a young girl who had been given to Naaman’s wife as a maid” (2 Kings 5:2, NLT). Why did you put so much emphasis on zombies and the video game “Zombies of the Apocalypse”? 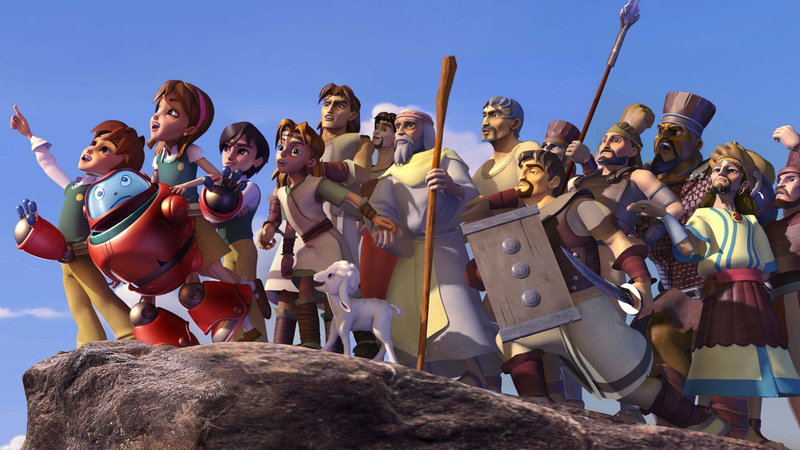 One of the primary goals of “Superbook” is to reach non-Christians around the world for Jesus Christ. To do that, we have to be culturally relevant to non-Christians. In today's world, “zombies” are a significant part of the world market in games and movies. However, Chris and Joy made it clear that zombies do not exist, and Joy pointed out that Chris’ parents do not allow him to play the game. Still, when Chris, Joy, and Gizmo saw Naaman and his awful skin disease, they reacted in fear and fled. Gizmo even thought he was a zombie. But God does not want us to be fearful. The Bible tells us, “For God has not given us a spirit of fear and timidity, but of power, love, and self-discipline” (2 Timothy 1:7, NLT). Why was the Syrian king’s letter written on a stone tablet? During the time when Naaman lived, around 850 B.C., writings that were intended to be permanent were often incised in stone. This also ensured that the message could not be erased or altered. An example from an even earlier time is when Moses received the Ten Commandments from God. The Bible records, “Then the LORD said to Moses, ‘Come up to me on the mountain. Stay there, and I will give you the tablets of stone on which I have inscribed the instructions and commands so you can teach the people’” (Exodus 24:12, NLT). Why did King Joram tear his garments? In the Israelite culture, tearing your clothes was an expression of great emotional distress. Since the king did not have any power to heal Naaman, it seemed to him that the letter was part of a scheme to create a conflict between Israel and Syria. This might even provide a pretense for an invasion by the Syrian army. The Bible records, “When the king of Israel read the letter, he tore his clothes in dismay and said, ‘This man sends me a leper to heal! Am I God, that I can give life and take it away? I can see that he’s just trying to pick a fight with me’” (2 Kings 5:7, NLT). It did not occur to King Joram that the letter referred to the miracles performed by Elisha. Why was Naaman told by Elisha to bathe in the river seven times? In the Bible, the number seven is often symbolic of completion or perfection. It could be that this was a test of Naaman’s faith, obedience, and humility. Bathing seven times in the river showed that his obedience to the prophet’s instructions was complete. It also showed that he was being humble and was not demanding that God work in the way he had expected. What was the light surrounding Naaman while he was bathing the seventh time in the river? We used creative license to show the healing power of God curing Naaman’s leprosy. Why did Naaman take dirt from Israel? Why couldn’t he just build an altar to the God of Israel on Syrian soil? In the ancient Middle East, many people believed in numerous gods, and they also thought that you could only worship a god in its own land or on an altar built with dirt from that god’s land. Naaman recognized that the God of Israel was the only true God, and he wanted to worship Him in Syria. During the harvest, what were the men cutting the barley with? They were using an ancient harvesting tool called a sickle. Jesus once referred to a sickle in one of His parables, “And as soon as the grain is ready, the farmer comes and harvests it with a sickle, for the harvest time has come” (Mark 4:29, NLT). He was shaking a basketful of barley and chaff. The barley is heavier than the chaff and would remain in the basket, but the chaff would be carried away by the wind. The first psalm says, “They are like worthless chaff, scattered by the wind” (Psalm 1:4, NLT). They were descendants of Lot, Abraham’s nephew. Why did Naomi tell Ruth to uncover Boaz’ feet, and why did Ruth ask him to spread the corner of his covering over her? The uncovering of his feet was a cultural and ceremonial act that Boaz would have been familiar with. When Ruth asked Boaz to spread the corner of his covering over her, she was asking that Boaz provide her with the “covering” or protection of marriage. Through marriage, she would be cared for and provided for. The basis for Ruth’s request was a commandment in the Old Testament Law; however, this commandment did not apply directly to Boaz and his relationship with Ruth. Nevertheless, out of kindness and love, Boaz agreed to marry her if he could. In all of their interactions, Boaz and Ruth showed themselves to be of high morals and good character. The townspeople thought highly of them, as was revealed when Boaz told Ruth, “…everyone in town knows you are a virtuous woman” (Ruth 3:11, NLT). Why did you have Ruth use the phrase “close relative” instead of “kinsman”? Although many Christians are familiar with the terms “kinsman” and “kinsman-redeemer,” many children would not understand these terms. When creating Superbook dialogue, we strive to use a Bible translation that is both accurate and easy for children to understand. (Chorus) Ha’nizanim Niru Baarez’ Et Zamir Hegia, Ha’teena Chanta Pagea, Ve Hagfanim Smadar. Arise, my darling, Arise, my beautiful one, See, the winter is past and the rains are over gone. and the blossoming vines spread their fragrance. “Kumi Lach” is based on the following verses from the Song of Solomon: “Rise up, my darling! Come away with me, my fair one! Look, the winter is past, and the rains are over and gone. The flowers are springing up, the season of singing birds has come, and the cooing of turtledoves fills the air. The fig trees are forming young fruit, and the fragrant grapevines are blossoming. Rise up, my darling! Come away with me, my fair one!” (Song of Solomon 2:10–13, NLT). Why were the Samaritans hostile to Jesus’ disciples? Why did they not let them enter the town? There was ongoing resentment between the Jews and Samaritans, and they disliked each others’ holy sites. The Jews claimed that the only proper place of worship was Jerusalem, so when Jews traveled through Samaria on their way to worship in Jerusalem, it made the Samaritans angry. The Bible tells us, “But the people of the village did not welcome Jesus because he was on his way to Jerusalem” (Luke 9:53, NLT). In their anger at the Samaritans, they felt that the judgment of God should fall on them. But Jesus had already taught love for everyone, even one’s enemies. He said, “But to you who are willing to listen, I say, love your enemies! Do good to those who hate you. Bless those who curse you. Pray for those who hurt you” (Luke 6:27-28, NLT). Why did you show the wounded man clothed only in a loincloth? We wanted to be historically accurate in illustrating the parable as it was told by Jesus. He said, “A Jewish man was traveling from Jerusalem down to Jericho, and he was attacked by bandits. They stripped him of his clothes, beat him up, and left him half dead beside the road” (Luke 10:30, NLT). This reveals how desperately the traveler needed help. The bandits had not only taken his money, but also his outer clothing. Without help and proper clothing, he would be exposed to the heat of the sun by day and the cold at night. Why didn’t the second Jewish man (the Levite) help the wounded traveler? What were the bricks for the Tower of Babel made of? The bricks would have been made of clay that had been shaped and then hardened in kilns. The Bible records that the people at Babel said to each other, “‘Let’s make bricks and harden them with fire.’ (In this region bricks were used instead of stone, and tar was used for mortar. )” (Genesis 11:3, NLT). Asphalt, otherwise known as bitumen, was a tar-like substance that at times occurred naturally or was produced by heat-refining petroleum or other natural substances. Why did you show angels coming down to the Tower of Babel when the Bible says that the Lord came down: “But the LORD came down to look at the city and the tower the people were building” (Genesis 11:5, NLT)? In addition to the verse above, the Bible also records the Lord saying, “Come, let’s go down and confuse the people with different languages. Then they won’t be able to understand each other” (Genesis 11:7, NLT). This implies that God was not alone when He went down to Babel. We used creative license to depict the presence of God in the form of rays of divine light emanating from heaven. In addition, when you consider God’s universal presence, He was there the whole time even when He was unseen. Gizmo’s scan revealed that Superbook had taken them to the land of Shinar, but where is Shinar? We used creative license to portray how God miraculously confused the language of the people. The Bible records the Lord saying, “Come, let’s go down and confuse the people with different languages. Then they won’t be able to understand each other” (Genesis 11:7, NLT). We also employed creative license to illustrate the connection between the events at Babel and hundreds of years later on the day of Pentecost. While different languages caused confusion and scattering at Babel, the Holy Spirit worked through different languages to bring people together and into the kingdom of God on the day of Pentecost. When you showed the Ascension of Jesus, why didn’t you show His nail scars? The sleeves of His robe were covering His wrists, which are where many Bible scholars believe the nail scars were. When the New Testament talks about Jesus being nailed in His “hands,” it uses a Greek word that has a broader meaning than the English word “hands.” The Greek word includes the hand, wrist, and forearm. Additionally, historians have discovered that when Roman soldiers crucified people, they drove the nails through the palms, wrists, or forearms. (If Jesus was nailed through His palms, then the soldiers would have also tied His arms to the cross with ropes.) So it is possible that Jesus was nailed through what we would call either His palms or wrists. Whichever way it happened, when can thank our Savior for dying for our sins. They were singing Psalm 150:6 in Hebrew: “kol hanneshamah tehallel yah halelu-yah.” In English, the verse exhorts, “Let everything that has breath praise the LORD. Praise the LORD” (NIV). What was the shining white cloud in the room, and what were the small white flames over the believers’ heads? We used creative license to depict the manifest presence of the Holy Spirit as the shining white cloud and flames. We made the cloud and flames white to symbolize purity and to emphasize the divine and pure nature of the Holy Spirit. The Bible tells us, “On the day of Pentecost all the believers were meeting together in one place. Suddenly, there was a sound from heaven like the roaring of a mighty windstorm, and it filled the house where they were sitting. Then, what looked like flames or tongues of fire appeared and settled on each of them. And everyone present was filled with the Holy Spirit and began speaking in other languages, as the Holy Spirit gave them this ability” (Acts 2:1-4, NLT). We used creative license to depict how the Holy Spirit supernaturally enabled the people outside to hear the people praying inside the room even though the windows were shut. In addition, wind is a symbol of the Holy Spirit. The Bible tells us that when the Holy Spirit came to the place where the believers were praying, “Suddenly, there was a sound from heaven like the roaring of a mighty windstorm, and it filled the house where they were sitting” (Acts 2:2, NLT). Why did you have to include Sarah’s death? How is it related to the marriage of Isaac and Rebekah? In the episode, the loss of Sarah brings to the forefront of Abraham’s mind God’s promise many years before. That promise was that Abraham would have many descendants through his son Isaac. But Isaac was not yet married, so Abraham knew it was time to find a wife for Isaac. In addition, Rebekah helped comfort Isaac regarding Sarah’s passing. The Bible tells us, “And Isaac brought Rebekah into his mother Sarah’s tent, and she became his wife. He loved her deeply, and she was a special comfort to him after the death of his mother” (Genesis 24:67, NLT). Why did you show Sarah’s dead body? Why did they put Sarah’s body on the table? During Abraham’s lifetime, and in tribes of people who kept sheep or herds, it was their custom for a son to marry someone from his own tribe. In addition, Abraham did not want his son to marry a woman who believed in the Canaanite gods, for she might gradually weaken Isaac’s devotion to the true God, the one who had spoken to Abraham and promised him descendants as numerous as the stars. Why did Abraham insist that his servant not take Isaac to live with Abraham’s relatives? Why did Chris, Joy, and Gizmo wear head coverings when Eliezer didn’t? In the Middle East, people normally wore sandals, and their feet would become dusty from walking across the dry and dusty ground. Therefore, it was customary to wash one’s feet before sitting for a meal, especially since people did not sit in chairs, but sat on cushions or mats on the floor. In addition, the hosts of the meal were expected to provide the water as a courtesy for their guests. In that culture, it was customary for a woman to cover her face when around a stranger. Also, since she was to be Isaac’s bride, she was showing respect and submission to him. The Bible reveals that God may speak to someone through dreams. For example, sometime after Jesus was born, an angel spoke to Joseph in a dream. The Bible records, “After the wise men were gone, an angel of the Lord appeared to Joseph in a dream. ‘Get up! Flee to Egypt with the child and his mother,’ the angel said. ‘Stay there until I tell you to return, because Herod is going to search for the child to kill him.’” (Matthew 2:13, NLT). On the other hand, we do not believe that all dreams contain a message from God. People need to be cautious, pray, and exercise spiritual discernment when it comes to dreams. Why didn’t Eli stop his sons from doing wrong things? When the Lord spoke to the young Samuel about Eli and his sons, what did it mean when He said that the people’s ears would tingle? This was a figure of speech meaning that they would hear stunning news that would continue to astound them even after the initial report. The New Living Translation words it like this: “Then the LORD said to Samuel, ‘I am about to do a shocking thing in Israel’” (1 Samuel 3:11, NLT). We wanted to illustrate physical effects when God’s voice thundered from heaven. So we used artistic license to show God speaking with such tremendous power that it created audio shock waves. The Bible tells us, “Just as Samuel was sacrificing the burnt offering, the Philistines arrived to attack Israel. But the LORD spoke with a mighty voice of thunder from heaven that day, and the Philistines were thrown into such confusion that the Israelites defeated them” (1 Samuel 7:10, NLT). Why did Samuel call the Amalekites “sinners”? The Amalekites had acted with hostility and cruelty to the Israelites after they asked for permission to pass freely through the land of the Amalekites. Instead of treating the Israelites with hospitality or even decency, the Amalekites attacked them when they were exhausted from their journey, and they killed many of them who were weak and straggling behind (Deuteronomy 25:18). God chose this time to bring judgment upon the people of Amalek for when they attacked and killed the weakest of the Israelites. The Bible tells us, “This is what the LORD of Heaven’s Armies has declared: I have decided to settle accounts with the nation of Amalek for opposing Israel when they came from Egypt” (1 Samuel 15:2, NLT). We don’t know what other evils the Amalekites may have committed, but God is a righteous judge, and everything He does is holy and right—even if we don’t understand it completely. The Bible reveals that David was a man after God’s heart. In other words, David wanted to please God and obey Him. The Bible says, “But God removed Saul and replaced him with David, a man about whom God said, ‘I have found David son of Jesse, a man after my own heart. He will do everything I want him to do’” (Acts 13:22, NLT). In their culture, tearing their clothes was a way of showing grief about the death of Saul and many others. The Bible tells us more about what happened: “David and his men tore their clothes in sorrow when they heard the news. They mourned and wept and fasted all day for Saul and his son Jonathan, and for the LORD’s army and the nation of Israel, because they had died by the sword that day” (2 Samuel 1:11-12, NLT). Why were the Jews taken captive to Persia? The people of Judah had been very disobedient to the Lord for years by doing things like worshiping idols. They persisted in their disobedience even after God sent prophets to warn them of His coming judgment. This judgment culminated in God sending other nations to conquer Judah and expel the people from the land He had given them. His judgment was meant to cause them to at last turn from their sins so He could bless them once more. When Nehemiah was still in Persia, he prayed to the Lord and “saw” the Jewish people in Jerusalem being taken captive by foreign soldiers. Was what he saw a memory or vision? Why did you make Elijah look old and weak? The Biblical events of 1 Kings 17 through 2 Kings 2 show Elijah serving as a prophet of the Lord for several years—but he may have been a prophet much longer. He seems to have been known and respected by different groups of prophets, so that might indicate that, in addition to his great anointing, he was a seasoned prophet. The Bible does not say when Elijah was born or how old he was, so we chose to use creative license to depict him as advanced in years. The Bible does not tell us explicitly, but it may have been a test of Elisha’s desire and determination. What did the prophets mean when they said “the spirit of Elijah” rests on Elisha? When Elisha says, “Where is the LORD God of Elijah?” why didn’t you have him use the covenant name of God, that is, “Yahweh”? Although the original Hebrew text uses God’s covenant name, Yahweh, most English translations translate it as “the LORD.” This follows the Jewish tradition of not pronouncing God’s name so as to avoid possibly using it in vain. How was Joy able to take her cell phone on the Superbook adventure? Doesn’t Superbook keep Chris and Joy from taking back any tech devices? While Chris and Joy are normally not able to take tech devices back in time, it was allowed this time since Joy’s cell phone was an important part of the dilemma she faced. Why didn’t Elisha say anything about the glowing and translucent cell phone that Joy was clearly holding in her hand? Should you have used the term “Arameans” instead of “Syrians”? Some Bible versions use the term “Syrians” while others use “Arameans.” The term “Syrians” is appropriate for Elisha’s time. What is Professor Quantum’s featured invention called and why is it so important? It is a Magnetic Gyro-Capacitor Self-Containing Energy-Stabilizing System, also known as the MagSys. Professor Quantum called it the cornerstone of his life’s work. It makes most of his other inventions possible. We can see in this an example of a powerful principle in the kingdom of God: if you are responsible and use well the understanding and ability God has given you, then He will give you more. Jesus taught, “To those who use well what they are given, even more will be given, and they will have an abundance. But from those who do nothing, even what little they have will be taken away” (Matthew 25:29, NLT). We used creative license to show that the lightning penetrated Gizmo’s outer metallic casing and affected his electronics. King David was using a metaphor to refer to his impending death. As Christians, we know that life does not end when the body dies, for a person’s spirit and soul live on. The Bible tells us, “And just as each person is destined to die once and after that comes judgment, so also Christ was offered once for all time as a sacrifice to take away the sins of many people. He will come again, not to deal with our sins, but to bring salvation to all who are eagerly waiting for him” (Hebrews 9:27-28, NLT). During Jesus’ time, oil lamps were commonly used to provide light at nighttime. The lamp usually contained olive oil with a wick sticking out that was lit. Compared to King David who had accumulated so many years of knowledge and experience, Solomon felt that he was very young and inexperienced. In some other Bible translations, Solomon says that he was only a child (NKJV) or like a child (NLT), but we chose to use the Contemporary English Version for this verse: “LORD God, I’m your servant, and you’ve made me king in my father’s place. But I’m very young and know so little about being a leader” (1 Kings 3:7). The Holy Spirit and wisdom are often associated in the Bible. For instance, the book of Acts records, “And so, brothers, select seven men who are well respected and are full of the Spirit and wisdom. We will give them this responsibility” (Acts 6:3, NLT). It also says, “None of them could stand against the wisdom and the Spirit with which Stephen spoke” (Acts 6:10, NLT). In addition, the Apostle Paul wrote, “When we tell you these things, we do not use words that come from human wisdom. Instead, we speak words given to us by the Spirit, using the Spirit’s words to explain spiritual truths” (1 Corinthians 2:13, NLT). What was Nebuchadnezzar bowing down to? He was bowing down before idols representing the gods of Babylon. He desperately pleaded for their help, but no help came because they are false gods. The Babylonians had many gods, as many as 13; however, even though the idols were immense and created by skilled artisans, they were still merely lifeless idols. The Apostle Paul explained, “Well, we all know that an idol is not really a god and that there is only one God” (1 Corinthians 8:4 NLT). The Bible reveals that at first Daniel and his friends were not informed about the king’s summons and demand about his dream. The Bible tells us what happened after the king’s decree: “And because of the king’s decree, men were sent to find and kill Daniel and his friends” (Daniel 2:13 NLT). It was Daniel’s custom to pray with the windows open toward Jerusalem. The Bible tells us, “But when Daniel learned that the law had been signed, he went home and knelt down as usual in his upstairs room, with its windows open toward Jerusalem. He prayed three times a day, just as he had always done, giving thanks to his God” (Daniel 6:10 NLT). She was following Daniel’s example of praying by an open window. However, it is not necessary to pray by a window at all. We can pray anywhere and God will hear us. What’s more, we can pray standing, kneeling, sitting, or even lying down. It is the attitude of our hearts that is important to God. God once told the prophet Samuel, “Don’t judge by his appearance or height, for I have rejected him. The LORD doesn’t make decisions the way you do! People judge by outward appearance, but the LORD looks at a person’s thoughts and intentions” (1 Samuel 16:7 NLT). Why did you have Jesus say that “all things are possible” in the scene in Martha’s home? Although it is not recorded that Jesus said this in Martha’s home, it is certainly possible that He did. The Bible records a time that Jesus said, “Anything is possible if a person believes” (Mark 9:23 NLT). It is likely that He taught important spiritual truths like this one more than once since He travelled from town to town and spoke to different people, so He could have shared this teaching also in Martha’s home. In addition, this verse fits well with the astounding miracle that occurs later in the episode. Here is the Biblical account of Jesus’ use of the term “sleep:” “Then he said, ‘Our friend Lazarus has fallen asleep, but now I will go and wake him up.’ The disciples said, ‘Lord, if he is sleeping, he will soon get better!’ They thought Jesus meant Lazarus was simply sleeping, but Jesus meant Lazarus had died. So he told them plainly, ‘Lazarus is dead’” (John 11:11–14 NLT). The original Greek words for “Jesus wept” mean that Jesus shed tears quietly or silently. We showed this by having tears well up in his eyes. Jesus was always led by the Holy Spirit to do God’s will (John 5:19). In this case, God’s will was not for Jesus to heal Lazarus of a sickness, but to raise him from the dead. That way, the faith of many would greatly increase. Jesus said, “Lazarus is dead. And for your sakes, I’m glad I wasn’t there, for now you will really believe. Come, let’s go see him” (John 11:14–15 NLT). Why did Cornelius call the angel “lord”? Isn’t that the title for Jesus? The Bible doesn’t tell us the name of the angel (Acts 10: 1-8) so we did not give him a name. Centuries before the They were surprised because Chris’s mother, Phoebe Quantum, had gone on a previous Superbook adventure but did not remember it afterward. This is shown in the episode “He Is Risen!”time of Peter and Cornelius, the prophet Jonah fled to the port of Joppa. The Bible tells us, “But Jonah got up and went in the opposite direction to get away from the LORD. He went down to the port of Joppa, where he found a ship leaving for Tarshish. He bought a ticket and went on board, hoping to escape from the LORD by sailing to Tarshish” (Jonah 1:3, NLT). How was Chris able to see Peter’s vision? Why were some animals considered “unclean”? The main reason for dividing animals into “clean” and “unclean” categories may have been to teach Israel to be holy, that is, different from other nations through its devotion and obedience to the one true God. Another reason may have been to support hygiene and health. What is the hall monitor’s name and what is his ethnicity? His name is Jia Wei and he is Chinese. What was the swirling mist descending into Cornelius’ home and what was the glow surrounding the Gentiles? We used creative license to visibly depict the Holy Spirit descending on the Gentiles when they believed in Jesus. The Bible recounts that when Peter told the Gentiles about Jesus, the Holy Spirit fell on them: “Even as Peter was saying these things, the Holy Spirit fell upon all who were listening to the message” (Acts 10:44, NLT). The episode simply follows the biblical account and is not making a doctrinal statement. Acts 10:46-48 says: “Then Peter asked, ‘Can anyone object to their being baptized, now that they have received the Holy Spirit just as we did?’ So he gave orders for them to be baptized in the name of Jesus Christ” (NLT). How is it that Lydia’s whole household wanted to be baptized? The members of Lydia’s household who had accompanied her to the riverside had also heard the message about Jesus and had the opportunity to believe. In addition, in Roman society, it was expected that the members of a household should follow the religion of the head of the household. No, we believe that salvation occurs at the moment of faith in Jesus Christ. Paul and Silas explained that faith in Jesus is the only requirement for salvation when they told the jailer, “Believe in the Lord Jesus and you will be saved, along with everyone in your household” (Acts 16:31, NLT). How did Superbook change Joy’s clothes while they were traveling through the time vortex? We didn’t want to put Joy in the uncomfortable situation of going back to Bible times in her hospital gown, so we used artistic license to let her wear her usual attire. Why did you show a real snake on the fortune-telling girl’s shoulders? Why did the jailer put Paul’s and Silas’s feet in stocks even though the cell had a locked door? Putting their feet in stocks was an extra means of securing them in prison, and the jailer wanted to ensure that they could not escape. The Bible tells us, “The jailer was ordered to make sure they didn’t escape. So the jailer put them into the inner dungeon and clamped their feet in the stocks” (Acts 16:23-24, NLT). “Not that I was ever in need, for I have learned how to be content with whatever I have. I know how to live on almost nothing or with everything. I have learned the secret of living in every situation, whether it is with a full stomach or empty, with plenty or little. For I can do everything through Christ, who gives me strength” (Philippians 4:11-13, NLT). Yes, it is. When Paul wrote to the believers in Thessalonica, he told them, “Be thankful in all circumstances, for this is God’s will for you who belong to Christ Jesus” (1 Thessalonians 5:18, NLT). “Praise the LORD! Yes, give praise, O servants of the LORD. Praise the name of the LORD! Blessed be the name of the LORD now and forever. Everywhere—from east to west—praise the name of the LORD. For the LORD is high above the nations; his glory is higher than the heavens” (Psalm 113:1-4, NLT). How long had the man been unable to walk? He had been lame since he was born. The book of Acts says, “Peter and John went to the Temple one afternoon to take part in the three o’clock prayer service. As they approached the Temple, a man lame from birth was being carried in. Each day he was put beside the Temple gate, the one called the Beautiful Gate, so he could beg from the people going into the Temple” (Acts 3:1-2, NLT). Peter explained that it was by the man believing in the name of Jesus that he was healed. He said, “Through faith in the name of Jesus, this man was healed—and you know how crippled he was before. Faith in Jesus’ name has healed him before your very eyes” (Acts 3:16, NLT). It might be that Herod saw the growing Christian community as both a religious and political threat. In addition, Herod was known for seeking the favor of the Jewish leaders and the Jewish community (which was mostly non-Christian.) The Bible records what happened: “About that time King Herod Agrippa began to persecute some believers in the church. He had the apostle James (John’s brother) killed with a sword. When Herod saw how much this pleased the Jewish people, he also arrested Peter” (Acts 12:1-3, NLT). The Bible records that the angel told Peter to get dressed, so he must have been sleeping without his outer clothing on. The book of Acts tells us, “Suddenly, there was a bright light in the cell, and an angel of the Lord stood before Peter. The angel struck him on the side to awaken him and said, ‘Quick! Get up!’ And the chains fell off his wrists. Then the angel told him, ‘Get dressed and put on your sandals.’ And he did. ‘Now put on your coat and follow me,’ the angel ordered” (Acts 12:7-8, NLT). When the angel spoke to Peter in prison, what does “gird yourself” mean? “Gird yourself” means to get dressed. After Peter escaped from prison, why didn’t the Christians believe that he was at the door? They weren’t expecting God to answer their prayer by having Peter escape from prison. This shows that God can answer our prayers in ways that we do not expect. The Apostle Paul wrote the following, “Now all glory to God, who is able, through his mighty power at work within us, to accomplish infinitely more than we might ask or think” (Ephesians 3:20, NLT). Why did Joy think that God’s will is not being done on earth? Joy said that it was because of all of the bad things she saw happening around the world—people living in abject poverty, cruelty and sickness. Joy was filled with compassion for people who were suffering around the world, and she was reminded of a portion of the Lord’s Prayer: “May your will be done on earth, as it is in heaven” (Matthew 6:10, NLT). Since Jesus taught us to pray for God’s will to be done on earth, that means that it is not always being done on earth. Praying is truly something powerful that we can do since with God all things are possible (Matthew 19:26). Still, there are times when we can make a practical difference in the lives of suffering people. For instance, John the Baptist told a crowd of people, “If you have two shirts, give one to the poor. If you have food, share it with those who are hungry” (Luke 3:11, NLT). In addition, the Apostle Paul wrote, “Therefore, whenever we have the opportunity, we should do good to everyone—especially to those in the family of faith” (Galatians 6:10, NLT). We used creative license to visually depict people’s prayers ascending to heaven. The book of Revelation pictures the prayers of believers rising to God: “The smoke of the incense, mixed with the prayers of God’s holy people, ascended up to God from the altar where the angel had poured them out” (Revelation 8:4, NLT). Why isn’t there more ethnic diversity in the Superbook videos? As you know, God loves all the people of the world (John 3:16), and Jesus commanded His disciples to take the good news to every distinct people group in the world (Matthew 28:19). What’s more, people of every nation, tribe, and language will be in heaven (Revelation 7:9). With these truths in mind, the staff of Superbook is dedicated to including an ethnically diverse group of children in the Superbook episodes. You can see more diversity in a few episodes of Season One, and you will notice much more diversity in the subsequent seasons. I’m having trouble accessing Superbook streaming videos. Can you help me? You will need your partner number to activate the streaming. It can be found on your Superbook DVD Club receipt. Be sure to make a note of the activation email address and password as they will be needed to log in to Superbook streaming through the Superbook.CBN.com website, Superbook Kids Bible App, and CBN TV Smart TV app.